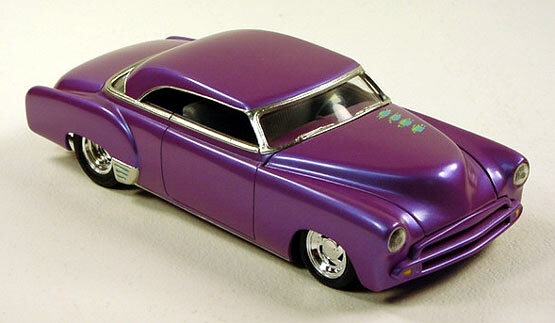 I built this AMT '51 Chevy Bel Air model kit as a lead sled, but I decided to make it a little different from the norm. Usually, lead sleds are they are just for slow cruising. I decided to build my custom with a little more "go-fast" attitude! So, the Bel Air sits with a rake and big meats in the back. It features a chopped top with the vent windows removed and the windshield laid back. The Chevy's body has been nosed, decked and smoothed. Also the headlights are molded in for a flush look. The bumpers were removed and custom roll pans were blended in. The paint is Tamiya metallic purple. I also dry brushed some brush stroke style graphics on to the hood which were all the rage back in the early '90's when I built this model. 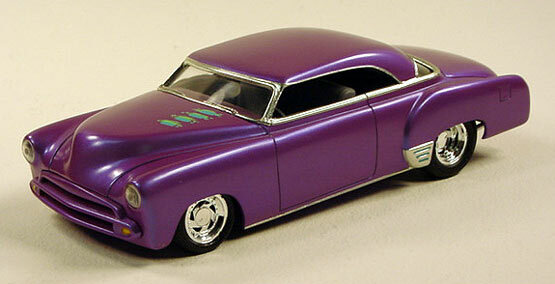 This model was pictured in Street Rodder, Custom Rodder, and Plastic Fanatic magazines.